Do you have areas of your house that have weak or no Wi-fi coverage? Perhaps the ‘dead zones’ are due to distance, numerous walls, or the type of walls between you and your router. Not only that but maybe there are so many people in your house requiring Wi-fi that your bandwidth is getting eaten up. 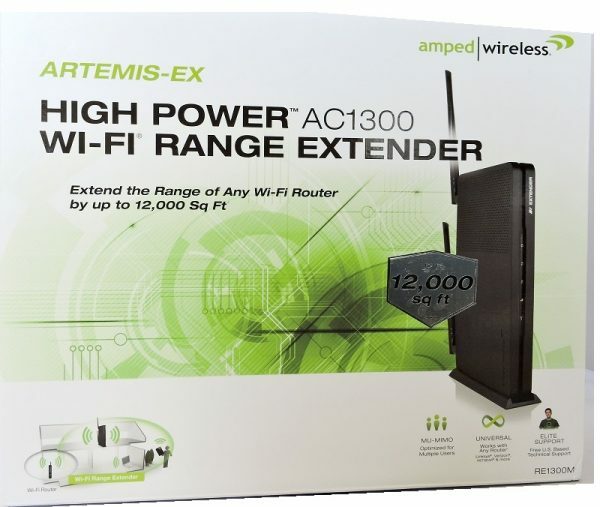 Enter the Artemis High Power AC1300 Wi-fi Range Extender, model RE1300M. This device can help your resolve your Wi-fi woes; extending your current routers’ range by up to 12,000 sq ft.
One of the best things about this Wi-fi extender is that it can extend the range of ANY router by up to 12,000 sq ft. That’s right. With only a few exceptions*, this extender will power you up with AC1300 speeds. The device is loaded with special features, too. 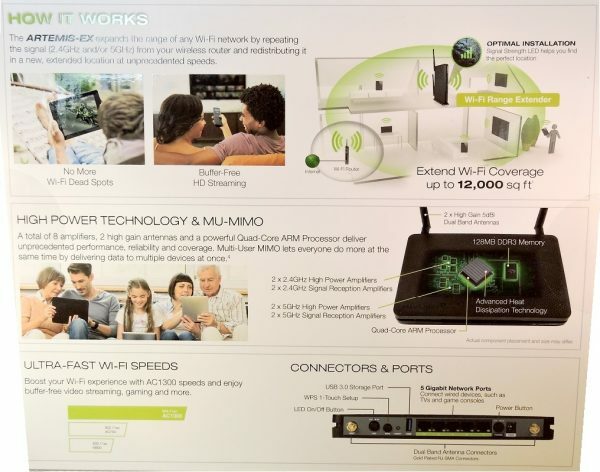 8 strong amplifiers and 2 antennas, Multi-User MIMO, Unmatched AC1300 Wi-fi for flawless HD & 4K streaming, More bandwidth for more devices (with no lag, even when multiple devices are streaming), Parental security features and Guest Networks, BoostBand™ Technology maximizes speed, Universal compatibility, High-powered Quad-core internet processor, Network bridging with 5 Gigabit wired ports, a signal strength LED that ensures you have optimal placement of the unit, Simple setup (more on that later), and a USB 3.0 port that lets you share files quickly (over your network or via FTP client). We all have so many devices connected to our networks at home. Smartphones, TV’s, ROKU, Apple TV, computers, laptops, tablets, even large appliances. The list goes on and on. A typical family of four can have around 50 or more devices pulling bandwidth from their network. Sometimes you just need a boost, and that’s where the Artemis-EX RE1300M comes in. It’s specially designed for multi-user, multi-device households. And with the features I mentioned above, this device can deliver unmatched range and reliability for up to 12,000 square feet of coverage in your home. 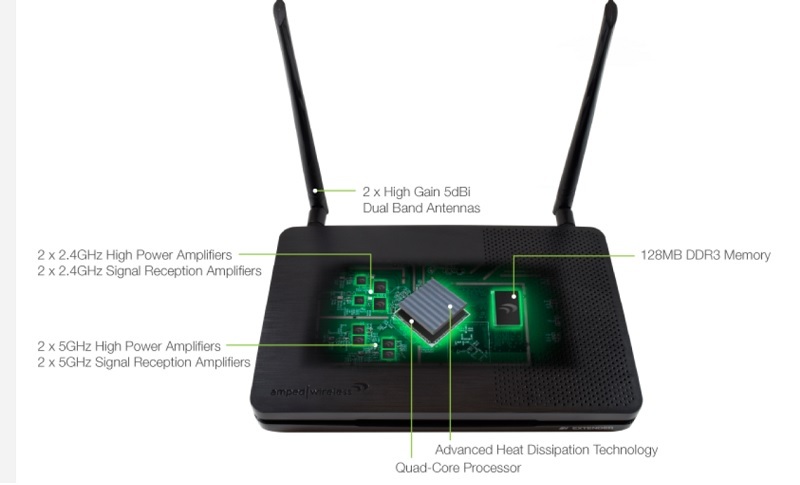 The AC1300 technology can deliver 399 Mbps on the 2.4GHz band, and up to 866 Mbps on the 5GHz band. Another great thing about this extender is that it has MU-MIMO tech, too. That means that it can send data to multiple devices at the same time, and with no lag or buffering. Uninterrupted streaming for everyone!! It’s pretty cool that you get an antenna gain of up to 5dBi and output power of up to 800mW. So let’s talk about the ports and connectors on the back. From top-to-bottom, you have your AC power jack, then the power button. You’ve got 5 Gigabit wired ports, then a USB 3.0 port (for file sharing). Below that is a little red “Reset” button, then a WPS 1-touch setup button. And finally, there is a button that lets you turn the LED’s on the front of the unit on/off. I like the layout on the back of the router. Everything is spaced nicely, and it’s laid out in a logical fashion. Another nice feature of the Artemis-EX is that it comes with a little attachable stand. You can put the stand on either of the extender’s sides, with the front facing down on the stand. or on its belly (using the pre-attached rubber feet). Basically, the stand allows you to decrease the footprint of the device. 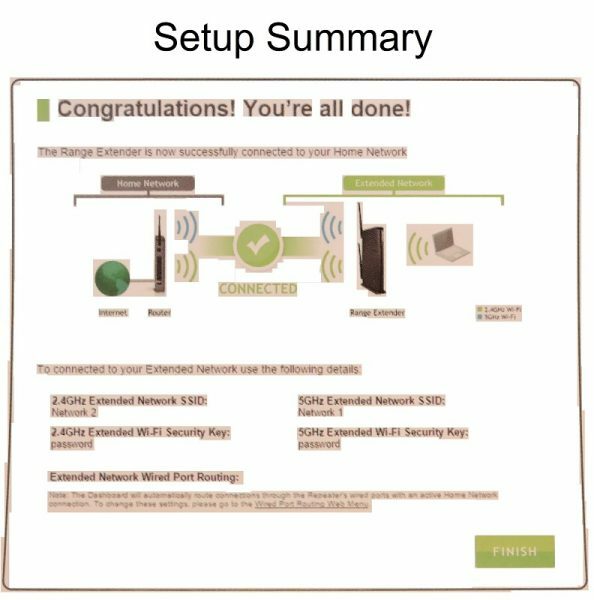 We need to talk about the setup of this Artemis-EX Range Extender. Before I begin, let me preface by saying that this unit extends your CURRENT network. Hopefully, you already have adequate security and firewalls on your current setup. 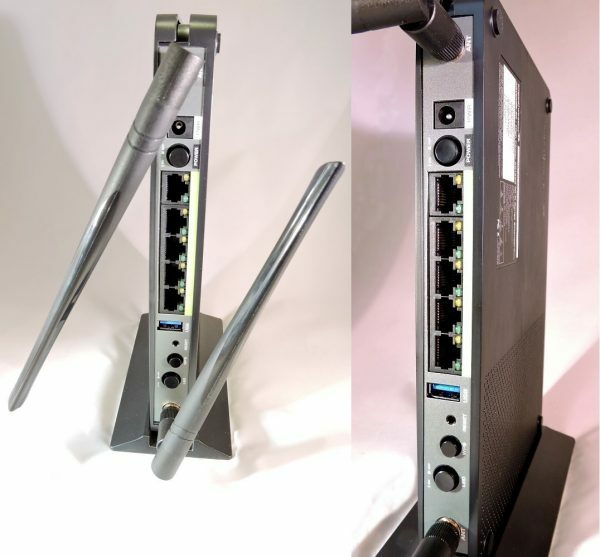 If not, make sure everything is ‘up to snuff’ because 1) you need it, and 2) this extender basically clones your current network and puts an “_RE” on the end of your home network’s name. 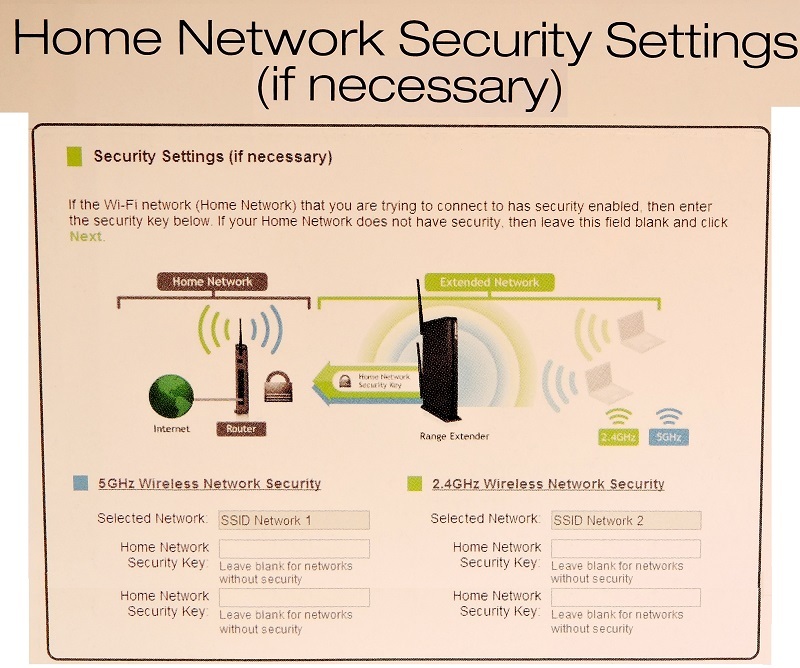 So if your home network’s SSID is “MIRROR2.4”, after being cloned, you would want to connect to the “MIRROR2.4_RE” network in parts of the house that previously had ‘dead zones’. 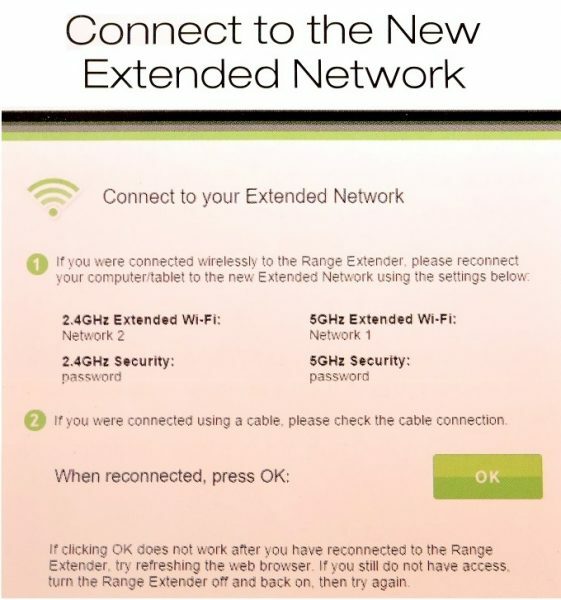 One thing I absolutely hate about this Range Extender is that there is no built-in security, firewall, or password. The moment you plug it in, scan for Wi-fi networks, and you see that there are two new networks available: “Amped_ArtemisEX_2.4” and “Amped_ArtemisEX_5.0”, and they are both OPEN networks. In my opinion, that’s a giant risk. The setup process IS pretty easy, and it only takes a few minutes get this unit up and running. But in today’s world, a few minutes is all a malicious hacker needs to get into your network. So work fast!! Read through ALL of the instructions before you even plug this thing in, and everything should go smoothly. You’ll know what you have to do and what to expect, and you should be OK. But I surely hate that it’s not pre-locked with a password or SOMETHING! Anyway, perhaps I’m paranoid, but I’m a secure paranoid. 1) Find a location about half-way between your existing router and your ‘dead zones’. 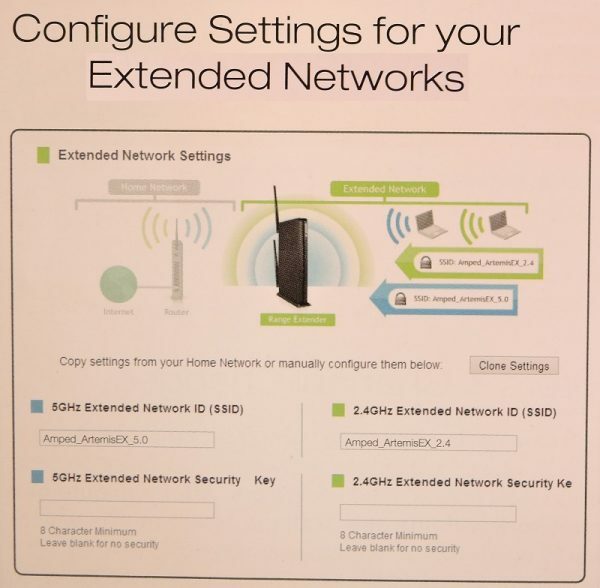 2) Attach the antennas to the Range Extender, then plug it in. 3) Go to your computer or tablet, scan for networks, and choose either “Amped_ArtemisEX_2.4” or “Amped_ArtemisEX_5.0”. (If your current router has 5.0 service available. 4) Open a web browser. Amped Wireless recommends using Google Chrome, Safari, or Internet Explorer 8.0 and up. You can NOT use Firefox. Go to the link they have listed on the included instructions. Accessing the site does not require internet access. 6) Click “Scan” for an available network to EXTEND. 7) You’ll want to select your current network name. If your home network name is “MIRROR2.4” and “MIRROR5”, and you have both 2.4GHz and 5GHz, you would click on “MIRROR2.4” and “MIRROR5” in each column. (See Artemis_EX example below). Be sure to select BOTH the 2.4GHz and the 5GHz if you have them. The left side has radio buttons in a BLUE 5GHZ column, the right side has radio buttons in a GREEN 2.4GHz column. See picture below. Make sure that the signal strength from your current router is 70% or higher. If it’s below that, you’ll need to move the Range Extender closer to your router. 8) This is when you set up your home security settings, (as Amped Wireless puts it: “if necessary”). :::eyes rolling::: You need to enter your current Wi-fi security key, here. 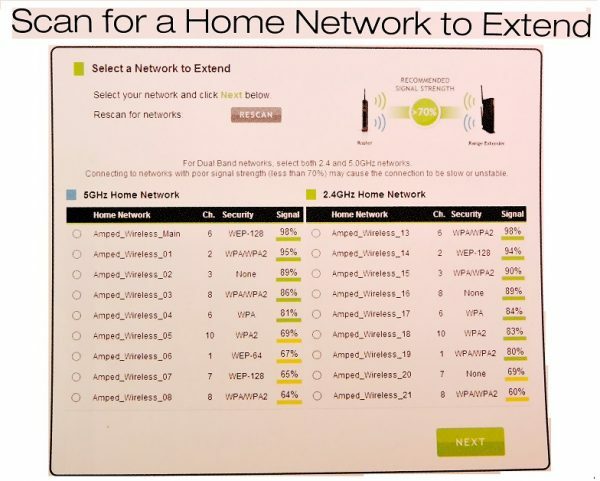 HOWEVER, you CAN choose to “Clone” the settings of your current network (the one(s) you selected in Step 7). In that case, go to step 9. 9) Configure settings for your new EXTENDED network. The default SSID’s of the extended networks are “Amped_ArtemisEX_2.4” and “Amped_ArtemisEX_5.0”, but if you Cloned your existing home network, your home network name AND security key(s) will automatically copy for you. The new SSID’s will be, for example, “MIRROR2.4_RE” and “MIRROR5_RE”. IMPORTANT!!! DO NOT CLOSE THE BROWSER OR REFRESH THE SCREEN AT THIS POINT! If you don’t get a summary page (I didn’t when using Chrome) after you’ve re-connected to the extended network, THEN it’s okay to refresh the page or go to a different website. 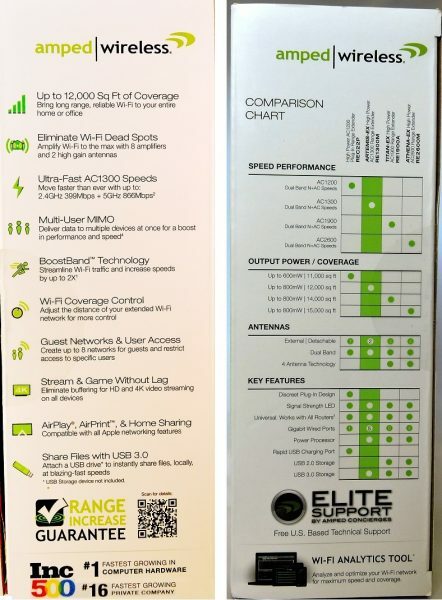 If you have any problems or questions, during or after setup, Amped Wireless Elite Support is readily available. And I can vouch for the “Elite Support”. I needed to contact them for some clarifications, and they arranged a day/time that was convenient for me, and called the exact minute they said they would. I was very impressed by that and with the Elite Support agent that assisted me who was patient, understanding, and professional. Overall, this device is well worth the price ($99.00), and it performs very well. I’ve voiced my concerns about the security issues, but that being said, the ODDS that you would be successfully hacked during the setup time are slim. It has a wealth of features and functions, with advanced technology that will make everyone in your house a lot happier about their internet needs. Once you have it set up, you can set parental controls as you wish. It allows you to set the exact days and times that the networks are available, control the strength of your signal, and even block specific devices from accessing the network at all. It is compatible with Android and iPhone. In fact, it’s compatible with all Apple networking features, Like AirPlay® and AirPrint™. 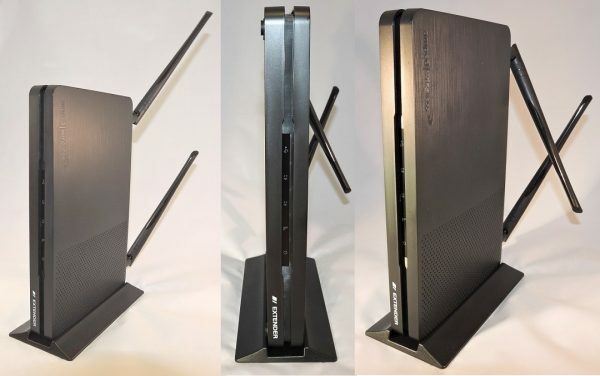 It’s very fast, and with the Multi-User MIMO, it pretty much solves any streaming, downloading, and gaming issues you may currently be having. 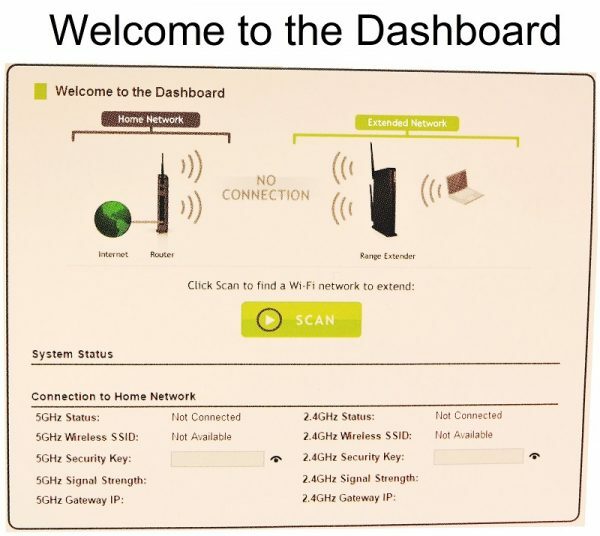 This device lets you create up to 8 networks for guests and restrict access to specific users. The 8 amplifiers and 2 antennas give you ample power output and signal boost. 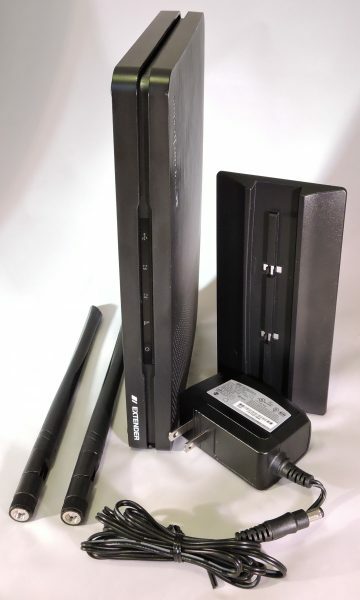 The Range Extender works with all brands of a standard single band (2.4GHz) or dual band (2.4GHz and 5GHz) wireless routers and service provider gateways. There are Red, Yellow, and Green LEDs on the front of the unit that indicate the signal strength being received from your router. The USB 3.0 port make file sharing easier than ever. It’s even wall-mountable! I would strongly consider buying this product. The only reason I can’t suggest to definitely buy is because of the setup time security issue. Source: The sample for this review was provided by Amped Wireless. You can get more information on their website and order there, or visit Amazon to order. So, did you see a speedup or larger range of your network? I was happy with the unit, except for the security issues I spoke about in the article. Thanks for the question!